After a few weeks of hurling anything they had in their vaults at screens to no avail, Hollywood takes the radical step of just releasing a couple of movies this weekend, but ones that people actually want to see. Leading the way is the year's clubhouse leader for the “I can't believe this is actually a movie” award, Real Steel, starring Hugh Jackman. Set in a near future where boxing has been banned and replaced with robot surrogates, Jackman plays a down-on-his-luck promoter who discovers an old fighting robot, and decides to get it back into shape for the ring to win a title (side note: I don't think that's how technology works). Along the way, he kindles a relationship with the son he never knew he had, and there's probably something in there about a crippled kid and a lost puppy or something. Somewhere along the way from the first trailers to release, this went from “seriously, they're kidding, right?” to “robots are cool!”, with people embracing the hoary collection of sports movie cliches that this film inevitably will consist of. They clearly can't be responding to Hugh Jackman's presence as a lead, since his record of opening movies outside of the X-Men franchise is spotty at best. Van Helsing might be his only real win other than those, though Australia did earn $200 million worldwide after bombing in America. But after a month of dour, unappealing releases, moviegoers are probably looking for something that's a bit of goofy fun. This will probably play as a hybrid of a sports film and an action film, with an opening weekend around $22 million. 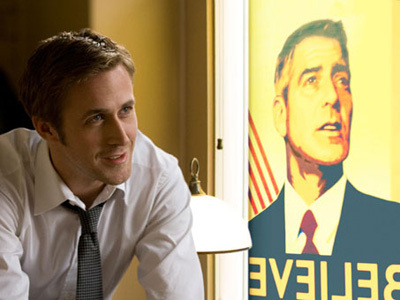 For those of us who can't quite get over the fact they remade Robot Jox, there's The Ides of March, a political thriller, starring and directed by George Clooney, who plays an Ohio governor on a run for president. The real lead of the game, however, is Ryan Gosling, who's well on his way to meeting his goal of starring in half the films released in 2011 (Jessica Chastain starring in the other half), as a political operative true-believer, who is nonetheless tempted into betraying his boss over a potential scandal. While it's difficult to believe there's anyone left to be surprised that politics is a dirty sport, the political thriller is a long respected genre, if not always a tremendously lucrative one. The most recent of these was State of Play, which opened to $14 million on the backs of Ben Affleck and Russell Crowe. Gosling and Clooney combined should exceed that in terms of star power, and then you have Paul Giamatti, Philip Seymour Hoffman, Marisa Tomei, Jeffrey Wright and Evan Rachel Wood to round out the cast.